Nothing says “Happy Holidays!” in Las Vegas like the Magical Forest at Opportunity Village! United Way of Southern Nevada staff members volunteered at the forest’s daytime program, Cheyenne’s Magical Bus Tour, for low-income students last month, and had a blast! The good news is that there is still plenty of time for you to help spread the joy of the season as a Magical Forest Elf! Opportunity Village needs volunteers to help run forest from Dec. 25th- Jan. 6th. Volunteers help keep kids and their families safe and help everyone enjoy the amusement rides, Santa’s gift cabin, and of course, the Magical Forest! Grab some family members and friends and sign up to volunteer this holiday season! Click here to see available dates and sign up. Please note that volunteers must be 18 years or older. UWSN Volunteers ready to help! UWSN Volunteers were excited to help spread the holiday spirit to low-income students at the Magical Forest. The holiday season is in full swing and nonprofit organizations all over the city are sending out calls for volunteers. One of these nonprofits, Opportunity Village, is famous for its Magical Forest, but will soon become well-known for it’s incredible performing arts program. Paul Garlin, an AmeriCorps VISTA member, is serving as the Office Assistant to Krysti Gabriel, the enthusiastic, dedicated director of Opportunity Village’s performing arts program. Though they already do so many wonderful things, Opportunity Village continues to expand. Thanks to the acquisition of an impressive grant, the V.I.A. (Very Important Arts) program now provides fine art, dance, music, & theatre classes at not cost to students, ages 6 to 17, in Clark County school special education classes. Also, funds are being raised to build an innovative Life Learning Park for Clark County citizens with disabilities. The park will offer life and social skill training programs for children and adults as well as serve as a wonderful venue for family respite. Construction begins in 2012. Looking at Town Square from the freeway, the sight appeared monotonous. However, I already knew that wasn’t the case. As my son, two friends who made the trek from California and I pulled into the parking lot, we saw a family, all of which were dressed as Santa Claus. I turned around and saw another family, this one with a dog, all of whom were also dressed as Santa Claus. We got out of our vehicle and raced to the congregation area to check in and retrieve our own Santa Claus costumes. Ah, The Great Las Vegas Santa Run had finally arrived! 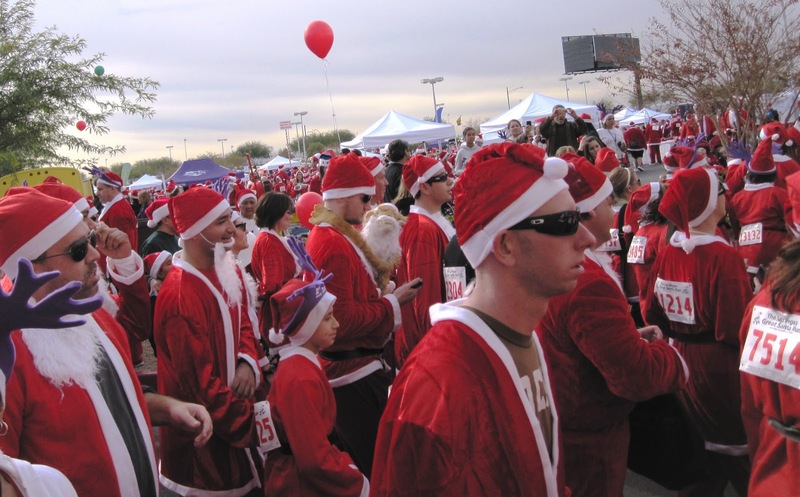 The Great Las Vegas Santa Run is an annual event hosted by Opportunity Village. The event is simple. You can either participate in a 5K run or a 1-mile walk. Nothing strenuous, just a fun run. Local bands entertained the crowd and Mayor Goodman offered words of praise to the organization and words of encouragement to the participants. The Fox 5 News team was present to air from the event and kick the run itself off. We chose to partake in the 5K course. The course was simple; three 1-mile loops around Town Square wearing a Santa Claus costume. As an added bonus, participants have the opportunity to register with the Guinness Book of World Records in an attempt to dethrone the Irish for the “largest gathering of Santa Claus” held since 2007. Our Santa’s came in all sizes from adults to infant children. The courses are also easy enough for children to be pushed along in strollers throughout the course. Overall, the event was a great one. Simply put, it’s a gathering of individuals in a fun, festive environment who are dedicated to helping change the lives of Opportunity Village’s clients. The primary idea behind the event is to raise money and awareness for the programs offered by the not-for-profit organization. 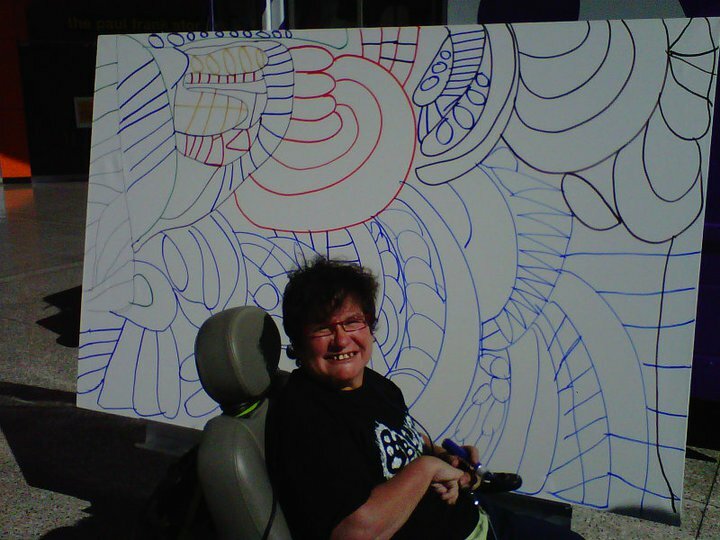 Opportunity Village focuses their efforts on those with intellectual disabilities. They provide vocational rehabilitation, social events, and employment services for thousands of clients annually while fulfilling the clients’ sense of belonging within the greater community. If you’re interested in volunteering with Opportunity Village click HERE for a list of their available opportunities. The Magical Forest is celebrating its 19th year of providing holiday joy to the Las Vegas community. More than 150,000 people visit the Forest every year, basking in the glow of more than three million lights on hundreds of decorated trees, riding the Forest Express passenger train, taking a spin on the Carousel and visiting with the Man in Red himself. Click HERE for more details, directions and to see some pictures. Bring your family and friends and check out this annual tradition.